FOUR DUBLIN BUS routes will be operated by a private operator from Sunday. Go-Ahead Ireland, which signed a contract with the National Transport Authority in April, will now run routes 45a, 59, 63 and 75. In August 2017, the UK-based operator won a tender competition to run 10% of Dublin Bus routes – 23 existing services. 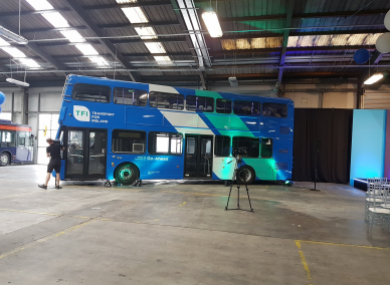 Ahead of Sunday’s changeover, NTA Chief Executive Anne Graham said that over the coming months passengers should expect to see “a very substantial increase in frequency and service levels on about 50 bus routes in Dublin” operated by both Dublin Bus and Go-Ahead Ireland. This is the single biggest programme of service improvements that the NTA has ever approved and it is indicative of the level of commitment we have to [make] the bus service better for more passengers across the network in Dublin. Bus fares will remain unchanged while Leap Cards and Free Travel Passes will both be accepted on the Go-Ahead routes. Passengers can also expect to see the blue and white Go-Ahead livery making its way through the capital from Sunday. Daytime frequency enhanced to every 20 minutes and every 30 minutes each evening and Sunday daytimes. Existing journeys diverting via Shanganagh Cliffs Estate are numbered 45B to distinguish them from the standard route, but apart from this the route is the same as the 45A. Departure times between Dún Laoghaire and Dalkey (and vice versa) have been coordinated with the 111 route where possible to offer evenly spaced departures along these roads. Other than that, the route stays the same. Daytime frequency on weekdays is still every 30 minutes with first and last bus times “broadly similar”. Frequency is enhanced to every 30 minutes on evenings and on Sunday during the daytime. Existing journeys via Sandyford Business Park remain. However, services will be augmented at peak periods. The route is changed in Dundrum to now serve Main Street, Taney Road and Sydenham Road. The timetable has been coordinated with route 175 between Dundrum and Tallaght, offering more evenly spread departures throughout the day. First and last journey times are similar while additional Sunday morning and evening journeys are set to be introduced. Email “Private operator set to take over four Dublin Bus routes from Sunday”. Feedback on “Private operator set to take over four Dublin Bus routes from Sunday”.